The 63rd annual Western Weekend, which celebrates West Marin’s agricultural heritage, drew one of its largest crowds in a decade last weekend. On Saturday, the West Marin 4-H Fair, the Western Weekend queen’s coronation, and a barn dance were all held at Toby’s Feed Barn. 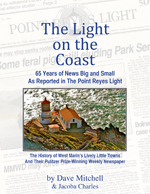 Sunday’s events began with a noontime parade down the three-block-long main street of Point Reyes Station. Despite the short route, the parade lasted more than an hour because street performances frequently stopped the procession. In addition, a few entries upon reaching the end of the route took a side street back to the starting point and made a second pass through town, thereby lengthening the parade. Following the parade, the Marin County Farm Bureau held a chicken barbecue in Toby’s parking lot while a band played, people danced, and 4-H members sold pastries. 4-H Fair — Olivia Blantz of Point Reyes-Olema 4-H (left) and Emily Charlton of San Rafael 4-H cradle their poultry prior to the judging in Toby’s Feed Barn. Olivia’s hen won Best in Show. Emily’s sister Erin Rose Charlton won the Showmanship award in the Junior category for her hen. Goats — Olivia Tyrnauer’s goat Cinnamon (right) won first place in Senior Showmanship. Olivia is a member of Mill Valley 4-H.
A Pigmy goat named Sylvester, which is owned by Megan Sintef of Nicasio 4-H, won a first place award in Junior Showmanship. Altogether five goats were entered for judging in the 4-H Fair. Rabbits — Amelia Paulsey, 6, from San Rafael 4-H with her bunny Butterfly is questioned by her mother Kari Paulsey, who happened to be one of the judges. For the first time in memory, no large animals such as cows and horses were entered in the 4-H Fair. As Allison Keaney, Marin County 4-H program representative, explained: “The fair in general has been running the risk of just not happening. With the alterations of the school schedules over the years, the first weekend in June [became] hard for folks. “Our fair only had 36 members enter, representing only 25 families. That is actually up from last year. We only had two large-animal entries in 2010 and 2011 and therefore scratched the competition. Western Weekend Queen Brenda Rico of Point Reyes Station riding in Sunday’s parade. Parade Grand Marshal Michael Mery of Point Reyes Station. Marin County Sheriff Bob Doyle (right) rides on a buckboard in Sunday’s parade. Last hurrah — Lynn Woolsey (D-Petaluma) takes a last ride in a Western Weekend parade as a congresswoman before she retires from the US House of Representatives. Incumbent Marin County Supervisor Steve Kinsey of Forest Knolls (center) does some last-minute campaigning during the Western Weekend parade in advance of this week’s election. Congressional candidate Norman Solomon (D-Inverness Park) and his wife Cheryl Higgins led a large contingent of supporters in the Western Weekend parade. The Aztec Dancers of Santa Rosa, traditional Western Weekend parade favorites, stopped periodically during the procession to dance to the beat of a drum. The dancers took third place in Adult Street Shows. They also won the parade’s Grand Prize. KWMR community radio, 90.5 FM in Point Reyes Station and 89.9 FM in Bolinas, was represented by numerous marchers and an elaborate float. The entry won 2nd place among Adult Drill Teams. Youngsters took advantage of the main street’s curb in order to have front-row seating for the parade — as well as to grab candies thrown from floats. Adult spectators took whatever seating they could find, which for Gary Martin (left) and Bill Barrett was a spot on the front of the judges’ stand. The Nave Patrola annually spoofs the World War I Italian Army, with the patrol’s soldiers marching chaotically and sometimes pausing to anachronistically shout, “Il Duce!” The group won the Best Adult Drill Team award, as well as the overall Best Drill Team award. In the early 1970s, an official from the Italian Consulate in San Francisco complained to parade organizers, the West Marin Lions Club, that the patrol disparaged Italians, what with its seemingly confused marchers colliding with each other and going off in all directions. Defenders of the patrol replied that many of the members are of Italian descent. The seventh and eighth grade rock band from West Marin School were highlights of the parade. Here the eighth grade performs some rock’n roll classics. The West Marin Kids Who Rock band won first place in Kids’ Music plus the overall Best Music award. Papermill Creek Children’s Corner preschool in Point Reyes Station took 1st place among Kids’ Drill Teams. The Wedding Party with Carol Rossi and pugs won first in Adult Animals. Possibly influencing the judges’ decision was their being given the top layer of the wedding cake. Blazing Saddle — Jason McLean of Point Reyes Station (left) sits astride one of two metal deer he built, with his deer shooting fire out its rear end. McLean’s entry took 1st place among Adult Vehicles. West Marin Community Services — which sponsors among other things the Food Pantry, the Thrift Store in Point Reyes Station, and the Tomales Bay Waterdogs swimming classes for youths — took 1st place among Kids’ Floats. A 1920s buggy driven by Ethan McNamara took 1st among Kids’ Horses and won the Best Horse award. West Marin Pharmacy joined the parade for the first time this year and won 1st place in Adult Music. Halleck Creek Ranch in Nicasio, which operates a riding club for disabled children, took 1st in Kids’ Animals and the Best Animal award. West Marin’s own tap dancers, the Fab-U-Taps, provided a street performance called Women of the World for Peace. The group took 1st place among Adult Street Shows, as well as the overall Best Street Show award. Following Sunday’s parade, the West Marin Lions Club held a chicken barbecue in the parking lot of Toby’s Feed Barn. Members of Point Reyes-Olema 4-H sold pastries, and the Doc Kraft Dance Band inspired people to get up and dance. I am always amazed at – and grateful to – these amazing horses for holding it all altogether so beautifully during all the stressful commotion….and to the riders for sharing them with us. They really add authentic grace and beauty to the event. Hi Dave – Loved going through your parade of photos of Western Weekend – the 4-H girls in the Red Barn and the parade shots. Brings back lots of memories. Hard to believe that Nave Patrol is still doing its thing! So many people, too. Wow. Thanks! The “kid” in the 8th grade band who’s playing the green guitar must have been held back a couple of times. The man with the green guitar is David Whitney, the music teacher at West Marin School. Sparsely Sage and Timely is powered by	WordPress 4.9.10 and delivered to you in 1.359 seconds using 56 queries.